I am finally getting to the end of the massive amount of green garlic that I bought at the Greenmarket. Whew! It has been a very delicious process, but it still feels good to polish it off. With the last three bulbs, I decided to go hog-wild with . . . not hog, shrimp! Big, fat, sugary sweet Florida Gulf shrimp. Deepwater Horizon be damned. Yeah, there are some scary reports out there, but it’s not like I have Gulf shrimp every day. And I just had four. They were supposedly wild, which is supposed to be okay. I live in New York City so I figure that the air I breathe is probably deadlier. They were so tasty. 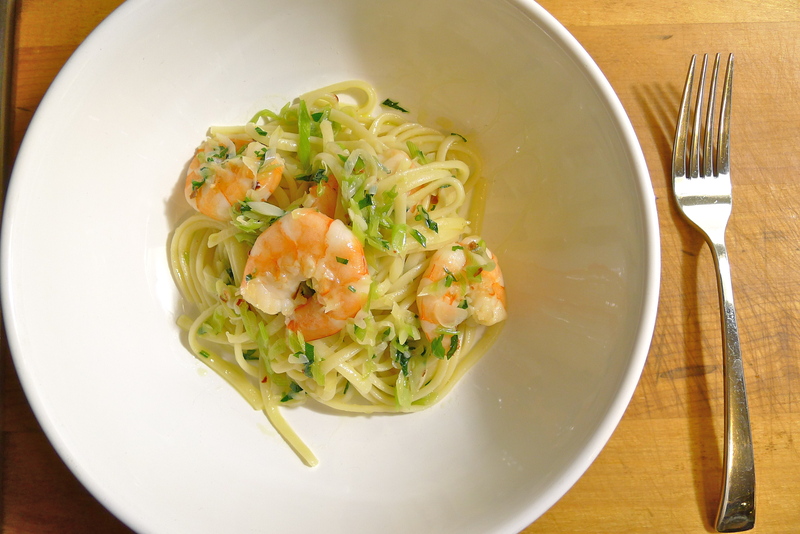 And the green garlic was a great spring twist on shrimp scampi, that Italian-American classic. No green garlic? The original calls for regular garlic and is still delicious. Don’t want to chance it with Gulf shrimp? Go for any shrimp that make your motor run. Or no shrimp at all — the sauce for the linguine is incredible on its own. On another note, has anyone been having a problem with the WordPress Reader? Generally, you should be able to see an updated feed of all the blogs you follow when you open it, right? Lately, it hasn’t been updating the some of the blogs that I follow. It’s really random, though. Sometimes it will just skip posts, or sometimes it just stops updating a single blog altogether. I read somewhere that the solution is to edit the list and refollow everyone. I started doing that, but it was so annoying that I stopped. Has anyone else had this problem? There must be another fix . . .
1. Bring a large pot of salted water to boil and cook the linguine until it is al dente. 2. While the pasta is cooking, heat a tablespoon of olive oil over medium heat in a heavy saucepan or a Dutch oven until it begins to shimmer. Add the green garlic and sauté it until it begins to soften and turn translucent. Stir in the butter, the parsley, and red chili pepper flakes to taste. When the butter has completely melted, carefully add the white wine and the shrimp to the pan. Cook the shrimp until they are pink on the outside and their flesh has turned white or opaque all the way through, about 3-5 minutes. 3. Add the cooked linguine to the pan and toss everything together. Turn off the heat and add the lemon juice to the pasta. Toss again before dividing it up the and serving. Oh, yum! I’m looking forward to fresh shrimp really soon…there’s a guy who brings ’em from Tybee to Athens the day they’re caught and sells them for $5/lb. Bookmarking this recipe for his next visit! Very lucky! I bet those are some amazing shrimp! I think it’s so important to support local farmers and fisherman. Given the choice between wild shrimp off local waters, and farm-raised shrimp (not an eco-friendly practice at all) shrimp from Asia, I will take local waters any day! Absolutely! We are also lucky enough to have a guy near us (just across the border in SC) who travels to Alaska for salmon season, flash-freezes the fish, and then sells his wild-caught fillets. So good! We pretty much only buy seafood if we can get it wild-caught by someone local. As far as fish farming, we avoid it for pretty much everything. But I have heard that catfish is easy to farm sustainably and that most catfish farms in the US use eco-friendly practices. I hear the same thing about catfish — which I love. That is amazing about that guy who goes all the way up to Alaska! Better to flash freeze it on site, I say. I bet it’s absolutely amazing! So simple, and so fresh and delicious. Perfect timing, as I had just bought some green shrimp (Well, we call them prawns Down Under) and I had all the other ingredients so I whipped it up for dinner. I added a little extra parsley and some fresh lemon thyme because it seemed like it would go well and I have so much growing right now. Result: heaven in a bowl! Thanks for another great recipe! I am so glad that you liked it! I bet the lemon thyme was super yummy in it. I should try that next time. Must be absolutely delicious! And so simple, great recipe. I always think that the simplest preparations are almost always the most delicious. If you have good ingredients, let them shine! It looks delicious and I would love to try it. It was delicious! If you try it, do let me know how it turns out! Yum! This looks delicious and the fact that there are only 9 items in the ingredient list makes this even more appealing. I will try this for sure. I am a big fan of recipes with less than 10 ingredients too! Sometimes I feel overwhelmed when the list is really long. There is something about a short list that makes a dish much less intimidating! This recipe is so quick and easy too. Do let me know what you think if you try it! Thank you! Your food always looks amazing to me! I’ve been having the same problem with the WP reader. Sometimes it seems to start working again when I delete the missing blog and re-follow. But really I’m not sure. Great recipe. Now I’ve got to run to the markets to replenish by own green garlic stash. I love that stuff! I finally got around to contacting WordPress support about it. When they got back to me, they said the problem was that I had only subscribed to 2 blogs — which is just not the case. I sent them a screen shot of the blogs I follow (more than 2), and they said they alerted the developer. The problem seems to be fixed (missing posts are no longer missing) . . . for now! Yes, I have to replenish stocks too. Rumors are that we are getting rhubarb soon. What about the fiddlehead ferns! Che bellissima! Love the clean pretty photo too. I have been having problems with WP in general … some of my regular posters say they can’t link to their blogs or WP doesn’t recognize them, and a lot of stuff is winding up in spam. Isn’t the WP thing frustrating? I try troubleshooting things myself via the forums, but just end up going in circles. I hope that you manage to iron things out on your end!